I needed a quick snack while out with the Baberoo this morning, so we dropped in to the café at Modern Art Oxford (30 Pembroke Street, OX1 1BP). What started off as a pit stop for a piece of cake turned into a much longer visit, as I became enthralled with both of the current exhibitions, Chapters by Haris Epaminonda and Black Drop by Simon Starling. Our visit started off with cake and tea, though, and boy, was it good. The Butterscotch Cake I ordered (£3.10) was moist and not too sweet for a butterscotch confection, and my pot of Earl of Grey tea (£2.10) from local company Jeeves and Jericho had a delicate bergamot taste without any tannic bitterness. I also got a Biscuit and Brazil Nut Tiffin (£2.50) to bring home to my husband, but it was half gone before he got any. Being a museums person myself (until very recently I led the Digital Programmes team at the V&A), I can never pass up an exhibition, so the Baberoo and I entered the poetic, ethereal world of Haris Epaminonda’s Chapters (exhibition ends 8 September). Four film installations comprise the main part of the exhibition, and the staged scenes and shots of natural elements, accompanied by an eerie, haunting soundtrack, were mesmerizing. Chapters also comprises another two rooms with three-dimensional installations. I was then just in time for a showing of Black Drop, Simon Starling’s 30-minute film about the transit of Venus and its relationship to the beginnings of cinema (exhibition ends 26 August). The film is beautifully shot in black and white, and although I’m not sure I understood everything about the astronomical phenomenon (last seen in June 2012 and not scheduled to happen again until 2117), just watching the film and being swept away by thoughts of the vastness of the universe was a thoroughly enjoyable experience. So, how did Modern Art Oxford’s café and exhibition space rate on my scale of baby-friendliness? My five criteria are menu, space, ambiance, facilities, and feeding (all explained in detail on my About page). 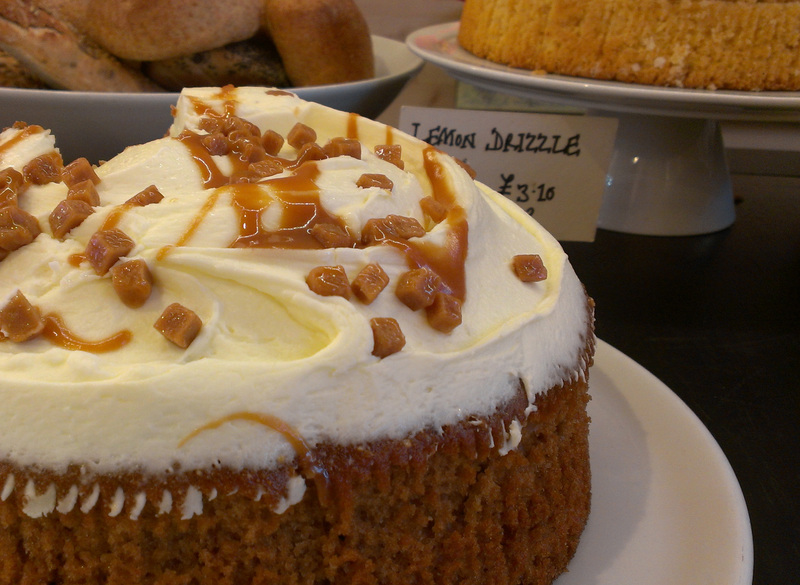 Menu: There’s one soup and three paninis on the menu each day, plus lots of cakes and other sweet snacks. Paninis aren’t the easiest thing to eat with one hand if you’re holding a baby, and neither is soup – but if you’re dextrous you can do it, and the cakes and other baked goods are easy. Go for tea/coffee and a sweet pick-me-up. Space: Plenty of it, and there were lots of parents with prams there today. During the summer the café is located in the side entrance to the museum off St. Ebbe’s Street. It’s a vast cavernous space that presumably must have been an entry for trucks or deliveries, but they’ve transformed it into an area that holds several tables with lots of room for baby carriages all the way through to the entrance to the gift shop. In winter the café is indoors on the ground floor, and has just as much space for carriages. The first time I went, in fact, there was a group of mothers with about seven baby carriages. 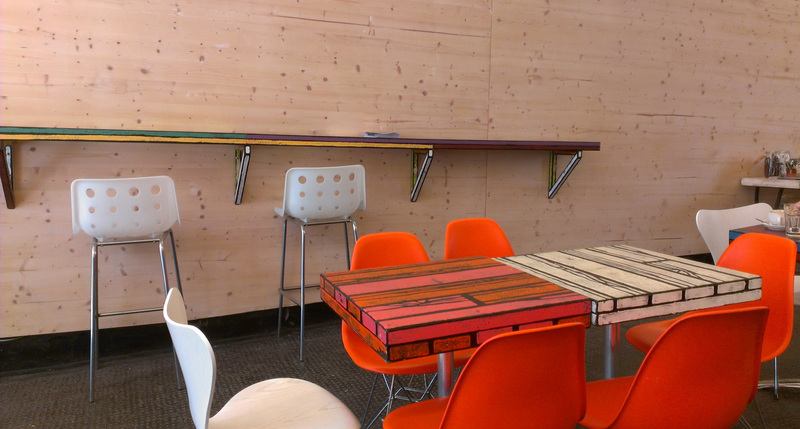 Ambiance: In the café it’s laid-back, colourful, and streamlined. Because of the high ceilings it’s light and breezy but also sheltered and quiet. You feel like you could stay for hours. Café staff were very friendly and brought sugar and cutlery to my table, seeing that I had too much to carry. In the museum, the ambiance is what you might expect from a modern art museum: spare and plain, concentrating on the works of art rather than on any décor. Museum staff were also very friendly and held open doors and curtains for me so I could manoeuvre the baby carriage through the gallery spaces. 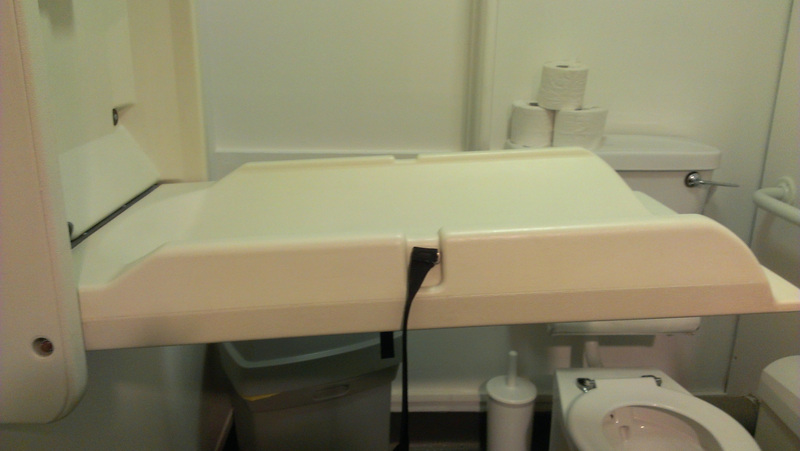 Facilities: The baby-changing toilet is on the lower level, past a space that is used for talks. Unfortunately, although the facility was clean and fresh-smelling, it caused me problems in terms of space. I could bring the baby carriage in, but then there wasn’t enough room to pull down the changing table or stand next to it to change the baby. I also couldn’t leave the carriage right outside the door because it would have blocked the entrances to both the men’s and women’s toilets. So I had to leave the door open with the carriage half-in and half-out of the bathroom. There were further problems with the layout of the room; once the changing table is pulled down there’s no way to reach the garbage can to throw away used diapers and wipes. It wasn’t an easy experience and the Baberoo also screamed her way through it (you would too, if the bathroom door was open so everyone could see you). Feeding: I was at a table where everyone could see me breastfeeding, although I didn’t mind, and I got a few smiles of encouragement from museum staff who passed by. There aren’t really any private, quiet corners in the layout of the café, so it’s not for shyer nursing mothers. There are no benches, sofas, or pillows, but if you and your baby are OK nursing from a standard-sized chair then it’ll be a fine experience. 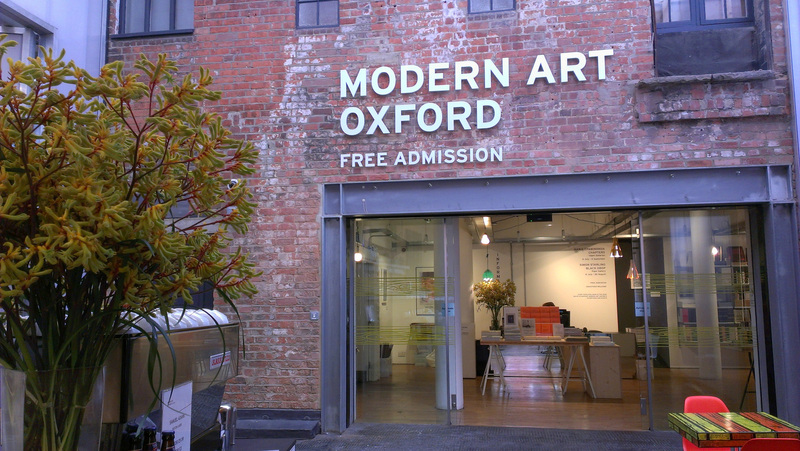 My final rating for Modern Art Oxford is a 7.75 out of 10. Despite the difficulty with the baby-changing facilities, I’ll be going again for cake and the chance to see world-class art in my new city.